The blanket stitch is a basic, popular embroidery stitch that can be used the along the edge of a fabric hem, as a surface embroidery stitch, a decorative frame or border or to stitch elements in place on an embroidery project. It is worked using open half-loops of stitching, similar to a hand-worked buttonhole stitch. This stitch can be worked along straight or curved lines on the surface of the fabric. It can also be used along fabric edges as an edge finish, or to attach appliques. Variations of the embroidery version of this stitch include the buttonhole stitch, which features the stitches worked side-by-side, tightly spaced, as well as closed or crossed blanket stitch and more. To work the blanket stitch, bring the needle up from the lower left edge and insert your needle through the embroidery fabric at the top of the location of the first stitch. Bring the tip of the needle through the fabric a short distance below the entry point, making a vertical stitch. If working along a marked line, the needle tip is brought through the fabric to the front. If it is worked along an edge, the needle tip extends beyond the edge of the fabric. 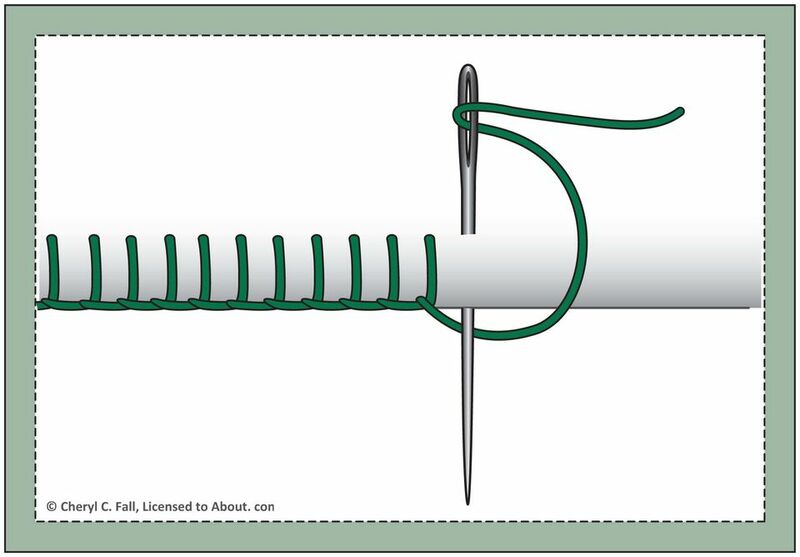 Pull the needle through to make an l-shaped half loop with the embroidery thread. Continue working the stitch, spacing them a short distance apart at regular intervals. To end, go back down to the right of the last stitch. When coming to a corner, work the last stitch on a side one stitch length from the corner. Work the next stitch right at the corner with the vertical line at a 45-degree angle. Turn the corner and work the first stitch on the new side one stitch length from the corner. This should create a square with a diagonal line in the middle. To change the look of this stitch, you don't even have to look to what would be considered true variations. Instead, play around with altering the spacing of the stitches or changing up the height. For example, create a pattern of taller and shorter stitches, or group several stitches close together, followed by a space, and then repeat. One variation that is useful for stitching flowers is referred to as buttonhole wheel stitch. This version is essentially blanket stitch worked in a circle, with all of the vertical stitches now meeting in the center. Not all patterns are conducive to working with blanket stitch, but some types of designs practically call out for this stitch. A cactus looks great because you are able to stitch the outline and needles at the same time. That said, you can use this stitch to work some interesting textures into your embroidery patterns! The sample above shows what blanket stitch looks like worked around an applique piece, used as a way to replace fill stitches within your embroidery. Regardless of how you are using the blanket stitch, however, the look of the basic version is essentially the same. Blanket stitch combines well with itself or other stitches. Try stitching two rows of blanket stitch so that the vertical lines are facing each other and nest within the spaces of the opposite row. This is referred to as double blanket stitch.